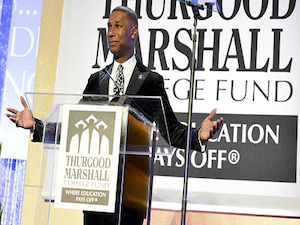 The Thurgood Marshall College Fund announced on Thursday the launch of the Center for Advancing Opportunity, which is supported by a $26 million gift from the Charles Koch Foundation and Koch Industries. Though eyebrows are likely to be raised due to Charles and David Koch’s support of conservative politicians and causes, TMCF President and CEO Johnny Taylor emphasizes that the new center will focus on nonpolitical issues facing “fragile” communities. According to a news release, the new center will provide undergraduate scholarships, graduate fellowships and grants to faculty working to establish university-based research centers focused on challenges facing “fragile” communities. In addition, the center will partner with longtime TMCF supporter Gallup to capture the sentiments on the ground of the communities the center will be focusing on. What Gallup will be able to do for us “is to be able to say with a real level of confidence that this is good research. If they say this is what people are thinking in these communities, this is exactly what they’re thinking,” Taylor adds. The $25 million gift UNCF received from the Charles Koch Foundation and Koch industries back in 2014 ignited a storm of controversy due to the Koch brothers’ support for conservative causes. Dr. Robert Palmer, an associate professor within Howard University’s School of Education, cautions that public perception of TMCF could suffer as a result of the gift they received. For his part, Taylor emphasizes that even the timing of the announcement — well after the presidential election — is an indication that this gift is not intended to sway any support in the Black community for conservative causes. Taylor also noted that Charles Koch himself did not support Hillary Clinton nor Donald Trump in the presidential race. “From the outset, Mr. Koch and every person that we dealt with said we will not bring politics into this discussion at all,” Taylor says. Hardin says that he is hopeful that the ideas and solutions put forth by the new center will challenge “everybody’s way of thinking. Because that’s how our society progresses, that’s how we get closer to helping everybody live a prosperous life. David Pluviose can be reached at dpluviose@diverseeducation.com.